July 20, 2015. With the ridiculously cold weather and unending rain we’ve been experiencing in Oslo this summer, Matthew and I decided we needed a week’s vacation somewhere warm and sunny. (As a southern girl, if I don’t get a warm summer to recharge my batteries, ain’t nobody happy.) And because we’re both pretty pooped out from job stress and adjusting to all the changes life has thrown at us this past year, we decided the trip needed to be super no-hassle. So we opted to go back to Paris and Provence. 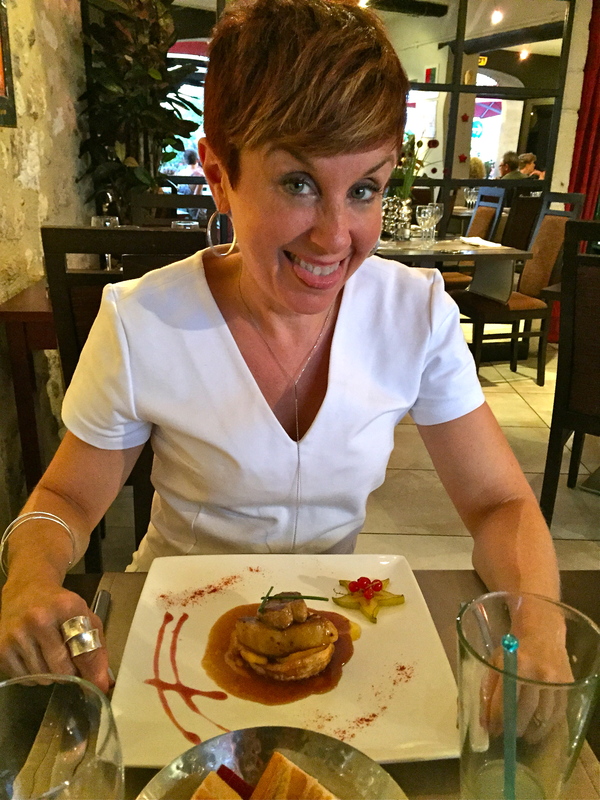 Someone’s really excited about her pretty plate of foie gras. In our defense for repeatedly going back to the same places every summer, with each trip we’ve focused on different themes: Roman ruins and Côtes du Rhône vinyards one year, Medieval sites and modern artists the next, etc. And that was the beauty of our plan this year. 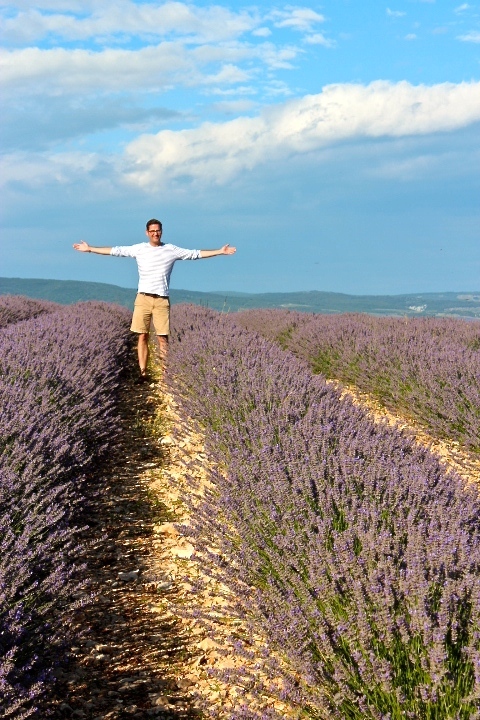 Because we’ve already toured Paris and Provence pretty extensively, our goal was to to simply relax and soak in the ambience rather than running ourselves ragged trying to see everything. Last year we did a “Van Gogh Day” where we traveled through fields of sunflowers and lavender. So for the first time ever, we took a vacation where each day wasn’t mapped out to the minute on an Excel spreadsheet. I’m serious; our usual holiday agendas are researched and scheduled beyond reason. I can’t help it, I’m a travel glutton and just a bit OCD. But on this trip, we had only one thing on our calendar each day: spend time sipping pastis by the pool — a complete departure for us, since we’ve never been pool people. But that’s what exhaustion and spending an entire summer in frigid Oslo will do to you. Since this trip was about living in the moment, here are a few of our favorites (along with some huge photo galleries to help capture the flavor). Selecting an antique toy sailboat from the international fleet of rental possibilities; working up a sweat chasing our Netherlands-flag-flying ship around the grand basin; prodding it into better behavior with a bamboo pole; then cleaning up the carnage after our renegade schooner plowed into a flotilla manned by shrieking five-year-olds. Strolling through the soporific gardens; paying our respects to the marbled queens of France standing at attention around the pond; then kicking back with a bottle of Perrier in the shade of the plane trees that line the Medici Fountain. If you can’t relax here, it’s time for a hospital stay. Clement Paudeau made these Petit Voiliers back in 1927. His wife sewed the sails, which have been replaced over time by modern sailcloth. You can rent the boats for a mere €3.50 per half hour and sail them on the Grand Bassin. In the background is the Luxembourg Palace, built around 1612 by Marie de’ Medici. Today the French Senate meets here, and supposedly the French Secret Service has their offices beneath the palace. Note the black “pirate ship” in the distance. All the kids fought over that one. Matthew prepares to launch his sailboat. For your money, you get both the boat and a pole to steer it with. The Medici Fountain, built in 1620, is a peaceful spot for people-watching and dreaming the day away. Standing outside the gorgeous Le Train Bleu restaurant inside the Gare de Lyon train station, where we took the TGV from Paris to Avignon. The journey took us across the breadbasket of France, where rugged little farms nestled in valleys of ripening wheat. Fields of sunflowers with satellite-dish heads tracked the sun’s path across the sky. White Charolais cattle — the most popular beef breed in France — mozeys over toward some shade. A pretty little Medieval town, complete with a Norman church tower. Golden hay bales glistening in the scalding sun. Gorgeous white dolomite bluffs on the way to Avignon. Lazily wandering dusty streets once painted by Van Gogh; catching kitties napping on centuries-old stone windowsills; ducking into an ancient cloister for a bit of shade and finding a guitarist and singer lustily performing flamenco in a vaulted monks’ dormitory. Circling the ancient Roman arena imagining gladiator combat of yesteryear and bullfights of today; toasting my birthday poolside with a glass of pastis — and rubbernecking at the typical French phenomenon of 60-year-old (married) silver-backed males canoodling poolside with their 20-something mistresses. Then finishing off the day slurping up a steaming bowl of garlicky, rich bouillabaisse while being serenaded by gypsy jazz street musicians. Originally a Roman trading center, Arles is probably most well known today for its sunwashed streets that became the subject of many of Van Gogh’s most famous works. Van Gogh shared an artist’s studio in Arles for a time with Gauguin. Later he was hospitalized in a nearby mental institution. Fine spot for a catnap. The peaceful Place de la Republique, where a classical guitarist lulled us into a dream state. The 12th-century Church of St. Trophime, the saint credited with bringing Christianity to Provence. The cloister of St. Trophime. The flamenco guitarist and singer in the cannon dormitory. We happened to come during a photography and art fair, which made for a festive air in town. The Roman amphitheater (90 A.D.) is situated in the city center. The tower was added in the 5th century, when the entire arena was turned into a fortress after the fall of the Roman Empire. Today, the arena is used for bullfights of the French variety, which involve pretty serious acrobatics. Our hotel, which was originally a 17th-century Carmelite convent, was converted into a hotel by Christian Lacroix in 2014. Pastis, an Agatha Christie novel, and a pool — what more do you need on your birthday? My favorite French dessert — meringue. Gypsy jazz for my birthday. Motoring through France’s version of the Everglades, which proved to be even hotter, sweatier, and sunnier than Florida’s swamp, but bizarrely peppered with herds of grazing black bulls and white horses. Hiking through the Ornithological Park for a view of nesting pink flamingos from Africa that migrate to breed and feed in these wetlands every summer — watching these ungainly creatures take flight in fighter formations is something you just don’t see in zoos. Pulling off for a view across the rainbow-colored salt plains of Salin-de-Giraud where “fleur de sel” comes from; dodging dinosaur-sized dragonflies as they zoomed over the flats in search of mosquitoes; and finally taking shelter from the oppressive heat in Les Salicornes, a roadside cafe that offered an unbelievably wonderful veggie terrine, paté, and ham tartine. The Camargue is a vast wetlands situated in the South of France, where the Rhône River empties into the Mediterranean. Huge brackish lagoons shelter more than 400 bird species — including flamingos. The Greater Flamingo (Phoenicopterus roseus) is the largest flamingo species. Most measure about as tall as I am (five feet), but some males tower at six feet tall. About 10 to 15,000 flamingo couples fly up from Africa to breed in the Camargue during the spring and summer. Each female lays just one egg in her nest made of mud. I love the deep salmon and black color under their wings. That pinky shade comes from the pigments in the brine shrimp (plankton) they eat. Flamingos filter food like shrimp and algae through their beaks, which have an unusual shape built for feeding with their heads upside down. White storks (Ciconia ciconia) are less common in the Camargue. The Grey Heron (Ardea cinerea) looks a lot like our Great Blue Heron, but it’s smaller. The Little Egret (Egretta garzetta) is the Old World counterpart to our Snowy Egret. A fledgling Little Egret in the nest. A flamingo in flight. Looks kinda awkward, right? The bright coloring beneath their wings is much more visible in flight. A squadron comes in for a landing. Representing the mammals in the swamp is the European Otter (Lutra lutra). We had to take a tiny ferry to continue our journey across the lagoons of the Camargue. Workers hand-harvest the flower-like crystals of sea salt floating atop the brackish water before they coagulate into huge crystals and sink. The flavor is delicate and minerally, best for applying to food after it has been cooked. A giant dragonfly that kept strafing us. Les Salicorne is a wonderful little historic place in the Camargue, almost in the middle of nowhere. The meal was absolutely fantastic — and the house rosé was some of the best we’ve had. Across the road from the restaurant was a ranch with lots of the famous “black bulls of the Camargue” — raised for centuries as the fighting bulls exported to Spain. Camarguais horses and bulls are reared together on many ranches in the Camargue. A type of cowboy called a “gardian” rides the white horses to herd the bulls. Herds of wild white horses are also allowed to roam free across the Camargue. Like all white horses, the Camarguais are born dark brown and grow whiter as they mature into adults. Waking up to TV coverage of the stirring yet surprisingly militaristic celebrations in Paris, then parading down the Boulevard des Lices with costumed Arlesiennes to witness an elderly gentleman being awarded the Légion d’Honneur for his service in WWII. Mingling with French families along the impossibly crowded streets of Cassis; sharing a giant ice cream cone filled with scoops of lavender, salted caramel, and cassis gelato; swapping seafood stories with our suppertime restauranteur as his two adorable poodles mooched for table scraps from charmed diners. Cruising the quay to gawk at the fabulous yachts of the rich and famous, then trolling the holiday stalls for handmade jewelry, art, and clothing. Camping out on a patch of lawn with hordes of oohing and aahing locals as fireworks kaleidescoped above our heads, all choreographed to a playlist of Edith Piaf’s greatest hits blasted from the harbor’s emergency broadcast system. We watched the Bastille Day (National Day) celebrations on TV, which were full of fighter-jet flyovers, military formations, and tanks rolling down the streets. Seems just a little unusual for a holiday that started out as a plebian rebellion against the all-powerful government (king). President François Hollande (front row, the guy in the blue tie) presides over the celebrations. In the center left, you can see some of the cool uniforms of the French Foreign Legion. The war memorial commemorating residents of Arles who died or went missing in WWI and WWII. Officers and Arlesienne women dressed in traditional costumes led the parade down the street. With his great-granddaughter standing by, André Ferrand, a 93-year-old WWII veteran, was awarded the insignia of Chevalier of the National Order of the Legion of Honour by General Philippe Vial for his voluntary service in September of 1944, in the 1st Artillery Regiment. Cassis is the poor man’s St. Tropez. It’s where regular French folk — not tourists — go to vacation. Matthew at Le Calendal, one of the wonderful restaurants along the harbor. The 12th-century fortress / castle at Cassis can be seen in the background. Who knew violets could be a flavor? Fishing boats, with the castle (now a cushy hotel, Le Château de Cassis) in the background. The fireworks over the harbor at Cassis, accompanied by an Edith Piaf soundtrack. Napping to the raucous cacophany of cigales (cicadas) crooning for their mates in the trees surrounding the hotel pool; sampling the unbelievable varieties of tapenade, olive mixes, sausages, cheeses, and breads offered on market day; sharing a bottle of rosé next to a patch of lavender literally vibrating from the ministrations of frenetically harvesting bees. Weaving in and out of the craggy Calanques — France’s answer to Norwegian fjords — for a look at hidden sandy coves and towering limestone spires. Having a Grace Kelly experience (the “To Catch a Thief” type, not the “farewell, Monaco” moment) speeding along the Route des Crêtes in our Peugeot convertible, absorbing the breathtaking panoramic views of the Mediterranean from atop Europe’s highest seaside cliff. Beautiful palms around the pool harbored hordes of cigales. The raspy, rhythmic sawing of cigales (cicadas) is one of the signature sounds of Provence. Sometimes it’s so loud that you practically have to yell to be heard. Market days in Provençal towns have been designated since Roman times — each town takes turns hosting an open-air market once or twice a week. Trolling the stalls filled with unbelievably fresh produce, meats, cheeses, and breads is a highlight of southern France. Here, Matthew contemplates which sausages we’ll be eating for lunch. Vendors offer honey straight from the hive, often tinged with the taste of lavender. The French place enormous importance on the quality of their produce. The variety of incredibly flavorful fresh fruits and vegetables is beyond anything I’ve ever seen in any other part of Europe, and far surpasses anything available in the U.S. Here, Matthew considers which of about 30 different olive blends will accompany our sausage lunch. The famous Coeur de Boeuf (Heart of a Steer) tomato. Eat one of these sweet-yet-meaty monsters, and you’ll understand why tomatoes are classified as fruits, not vegetables. Every imaginable spice can be purchased at the market. The massif of Cap Canaille forms a stone rampart above Cassis. The “Great Head” is the highest maritime cliff in Europe, measuring about 1,400 feet high. The harbor at Cassis has boats that provide cruises into the Calanques. There are 11 Calanques along the coastline between Marseille and Cassis. Our tour took us to eight in about two hours. The Calanques are steep-sided, narrow inlets or coves made up of limestone or dolomite. They look a bit like fjords, but weren’t made by glaciers but by rivers that cut steep-sided valleys, which eventually became flooded by the sea. The winding road of the Route des Crêtes (route of ridges) takes you along the top of Cap Canaille for fabulous views of the sea below. You’ll also get an eyeful — and an aromatic snout-full — of the famous garrigue vegetation, with its twisted pine trees and wildflowers. Sometimes the wind is so strong that this 9-mile road from Cassis to Ciotat is closed to car traffic. The only car left in the rental car lot was this convertible Peugeot, so I got to have a Princess Grace moment, head scarf, sunglasses, and all. Looking down upon Cassis from the top of the massif. It’s strange to be so high above the clouds that they come rolling up over the cliff and hit you right in the face with a blast of mist. Closing out our trip by spending some quality time in our favorite little Paris gem, where we contemplated the mysteries of the Lady and the Unicorn tapestries, tried to identify all the animals and flowers cavorting in the background, and wondered anew how Medieval weavers managed to capture so much detail and movement with just a few changes in thread color. Plus, where else can you wander through an unbelievably intact Roman bath, wrapped inside a gothic abbey, converted into a bishop’s palace, and eventually reborn as a museum of art from the Middle Ages? The frigidarium (cold water pool) of the 3rd-century Roman bath. In 1334, King Philippe-Auguste sold the ruins of the Thermes de Cluny (Roman baths) to the Bishop of Cluny (Burgundy), who planned to build a townhouse on the site where his abbots could stay when they came to visit Paris. The current structure, a later rebuild, dates to 1485-1510 and contains a chapel with incredible fan vaults and delicate tracery that are stereotypical of French Flamboyant Gothic architecture. The well in the abbey cloister. The “chess players” stained glass window is a metaphor for an amorous conquest. Love the headdresses. Who doesn’t need a gold weasel with gemstone eyes and ivory teeth? Incredible Medieval paintings. I seriously want a chance to try and balance one of those headdresses on my noggin someday. German master Johann Lichtenauer’s training manual for would-be knights. This little monkey isn’t thrilled about being chained in his “millefiori” background, which contains dozens of accurately detailed flower species. “Taste” is the theme of this panel. The lion and unicorn carry banners and wear capes with the Le Viste family’s coat-of-arms. In “sight,” the lady offers the unicorn a view of himself in a mirror. In “sound,” the lady lulls the beast to sleep by playing an organ. Note the beautiful details captured in the folds of her gown and on the carpet beneath her feet. In “smell,” the lady weaves a wreath of flowers while the monkey mimics her. The mysterious sixth panel is entitled “À mon seul désir” (my sole desire). It may mean that the five senses bring greater intellectual understanding, or it may mean that the sixth sense is the heart, which brings spiritual understanding. Note how the changes in thread color give a 3-D effect to the folds in her sleeves and the curve of her bodice. I love her hairstyle — called “the egret” for obvious reasons, it involved wrapping braids around the head to form a little tuft above the eyes. I love you as princess grace in the peugeot!